Discussion in 'Stock Market Today' started by bigbear0083, Apr 1, 2016. 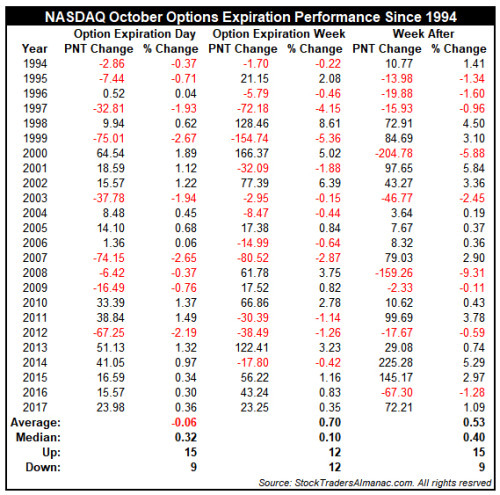 Since 1994, October’s expiration day tends to be mixed with average losses across the board even though S&P 500 and NASDAQ have advanced more often than not. 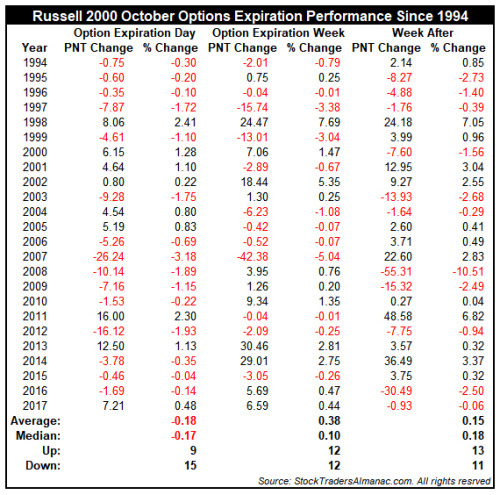 Expiration week and the week after are mildly bullish. DJIA and S&P 500 have the best long-term records. 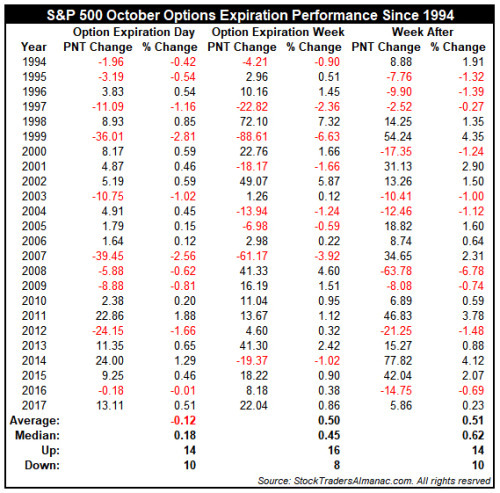 October’s reputation for volatility can be seen with wild daily and weekly swings in the tables below. Weekly moves in excess of 4% appear throughout the tables below. However, not all of these big weeks were losers. October is still only a little more than 15 trading days old, but there are already 31 stocks in the S&P 500 that are down over 15% on the month. 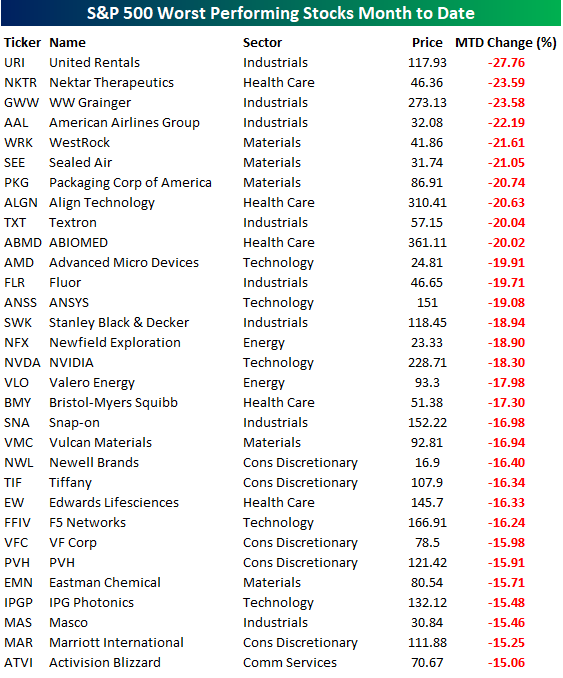 The table below lists each of those 31 names, and while it’s not uncommon to see volatile stocks from the Technology or Consumer Discretionary sectors topping the list of worst performers during a market decline, not a single one of the ten worst performers so far this month comes from either sector. 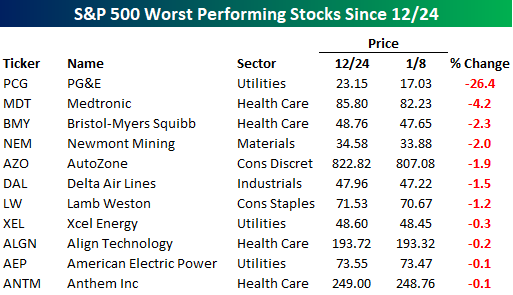 As shown in the table, the sectors represented in the list of ten worst performers are Industrials, Health Care, and Materials, and the stocks are all down well over 20% already this month! The worst performing Technology stock on the list is Advanced Micro (AMD), which is down just under 20%, while Newell (NWL) is the worst performing stock from the Consumer Discretionary sector with a decline of 16.4%. Looking at this overall list of names, it’s cyclical stocks which dominate with eight stocks from the Industrials sector alone. Meanwhile, no stocks from the Consumer Staples, Financials, Real Estate, or Utilities sectors made the list. So much weakness in a number of large-cap cyclical stocks has been a big reason why the ratio of cyclicals to defensives has pulled back so farover the last month. The recent spell of 2-3% daily market moves has many concerned that this could turn into something more sinister or bearish. That is always a concern and still possible, but it does not appear to be highly likely at this time. Current market action is less tame than it has been over the past several months and years, but the quantity and magnitude of these larger daily moves is minor and not indicative of a deeper downdraft. Hat Tip to the folks at TradeNavigtor.com and Genesis Financial Technologies, especially Heath in tech support for help with these charts and having the software to do it easily. For the past several months we have often heard investors and commentators saying, “Sell in May did not work this year and it hasn’t worked for the past several years” or “Sell in May is dead.” Not true. Everyone forgot about October. We always are leery of October. 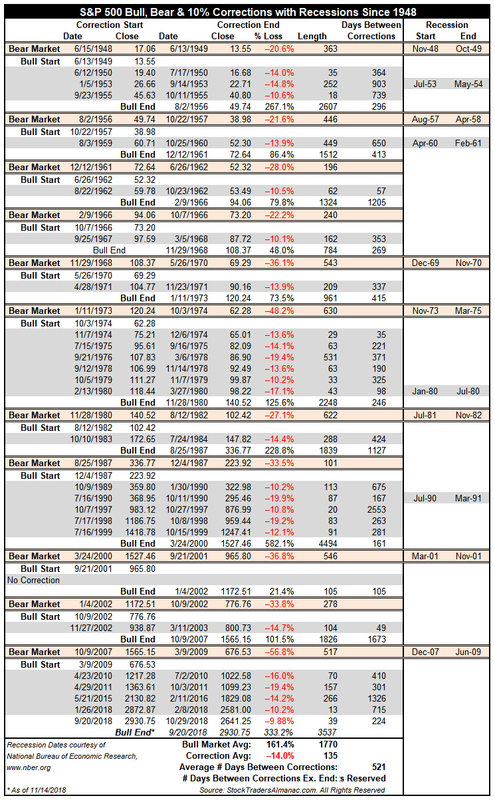 In response to our post last week on “What Happened Last Time We Had 2% Moves?”, we looked back further to 1997 and found that mild clusters of 2-3% daily market moves like the current one, have occurred around mild corrections, as we had from late January to early April 2018, and “mini-bears” like we had from August 2015 to February 2016. Just compare the image up top of the past two years of the S&P 500 with daily moves of +/- 2% highlighted in blue with the images below of 2015-2016 and 2007-2008 and you can clearly see that what is going on right now does not compare with the more alarming rate of big daily moves at more negative market junctures. This is October, this is normal. VIX is still relatively calm. Sentiment has come off its high horse and fundamentals remain supportive. Yes we are having some rather typical midterm election politicking and there are some geopolitical, diplomatic and trade concerns, but from our historical vantage point and current analysis our outlook remains positive for the next several months for the “Sweet Spot” of the 4-Year cycle, and in fact this sell off makes it more attractive and sets us up for an excellent MACD buy trigger for our Best Six Months Seasonal Buy Signal. Expect some more churning and selling and rallying over the next several days and weeks as the market finds support and wait patiently for technical confirmation and our buy signal before allocating fresh capital to the long side or coming off the sidelines and getting less defensive as we have been for several months. Yesterday afternoon’s selloff was the eleventh DJIA Down Friday/Down Monday of 2018. 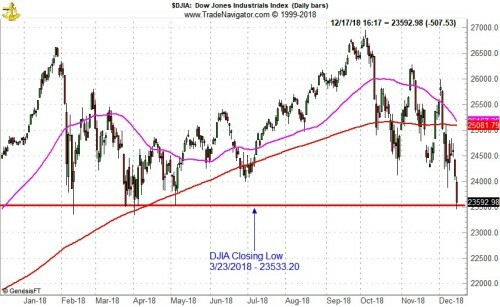 The combination of a DJIA Down Friday* followed by a Down Monday** has been a fairly consistent ominous warning, but they have also occurred at significant market inflection points (interim tops and bottoms). The previous occurrence was on September 10, 2018, just three weeks before DJIA closed at its last new all-time high. Since January 1, 2000 through todays close there have 201 DJIA Down Friday/Down Mondays (DF/DM) including todays. From DJIA’s closing high within the next 7 calendar days to its closing low in the following 90 calendar days, DJIA has declined 182 times with an average loss of 6.9%. Declines following the DF/DM were greater in bear market years and milder in bull market years (see page 74 of Stock Trader’s Almanac 2018). 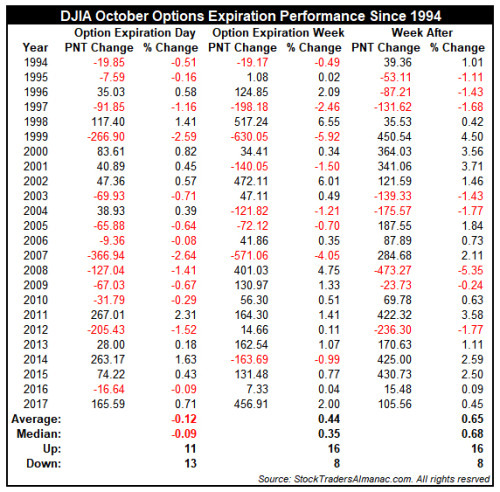 The eight times when DJIA did not decline within 90 calendar days after were following DF/DMs on October 7, 2002; May 19, 2003; November 17, 2003; February 3, 2014; October 13, 2014; October 31, 2016; September 25, 2017 and October 9, 2017. When DJIA’s close on Monday of the DF/DM is used as the starting point of the subsequent decline (a lower price), DJIA has declined an average of 44% over the next 90 calendar days, but there were 33 times when no further decline occurred. 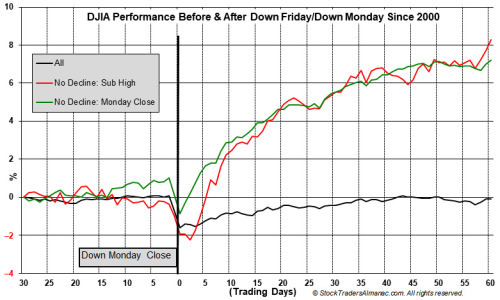 In the following chart, the 30 trading days before and 60 trading days after a DJIA DF/DM have been plotted alongside the 8 times there was no low after the subsequent high and the 33 times there was no lower low after Monday. Based upon this graph, if DJIA recovers the losses from yesterday’s DF/DM within about 4-7 trading days, then the DF/DM quite likely was an interim bottom. However, if DJIA is at about the same level or lower than now, additional losses are more likely. *Friday or the last trading day of the week. **Monday or the first trading day of the next week. Today might be Halloween, but the market this month sure has added a new layer to fear—hasn’t it? 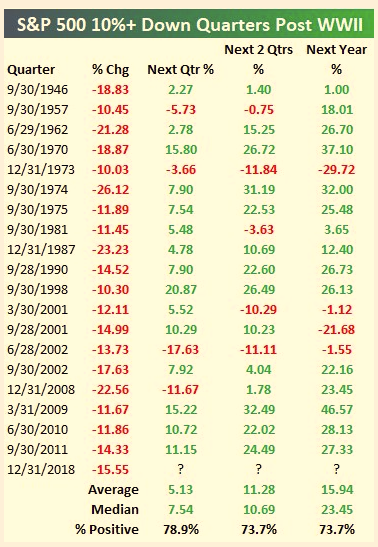 Unless the S&P 500 Index ends the month with two consecutive green days, this will be the first time in history the S&P 500 has gone the entire month of October without back-to-back gains. That right there sums up how strong the selling has been. Recent U.S.-China trade headlines. We continue to expect a trade agreement of some sort by early 2019, given how much both sides have to lose. But markets are susceptible to headline risk between now and then, and there is always a chance the relationship deteriorates to such an extent that more tariffs will be put in place and potentially become permanent—causing further supply chain disruptions that would likely put added pressure on companies’ profitability. The Fed could make a mistake. The Federal Reserve (Fed) seems fully committed to further rate hikes. Should long-term interest rates fall due to growth concerns while (short-term) rate hikes continue, the central bank could potentially invert the yield curve, which historically has been a reliable recession signal. With wage pressures building, an uptick in inflation that spooks the Fed in 2019 could be possible. Stocks have lost technical momentum. 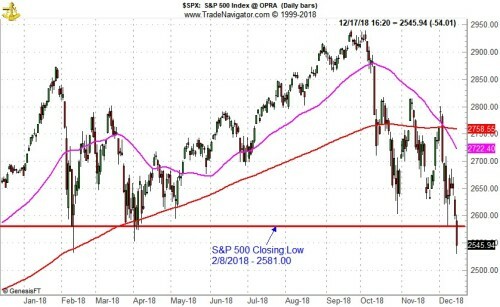 The S&P 500 broke below its 200-day moving average on October 11, and that gap is starting to widen, indicating that technical momentum is deteriorating. In addition, we have not seen the type of panic selling that has marked recent major lows, like those in August 2015, February 2016, and February 2018, based on the percentages of stocks that are oversold and put-call ratios, which are measures of bearish sentiment. It isn’t all bad news though. 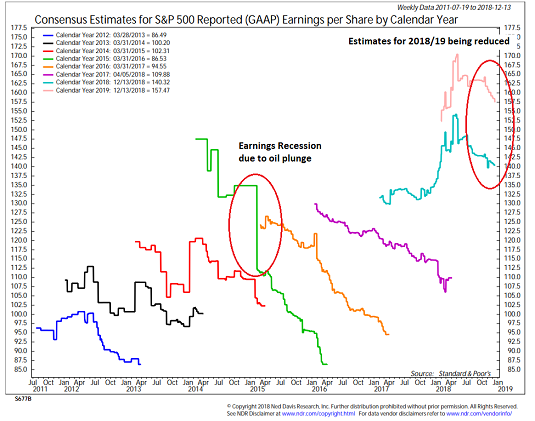 “Even though the list of worries has grown in October, it is quite reassuring to know that consensus estimates for 2019 S&P 500 earnings per share (EPS) actually increased this month! 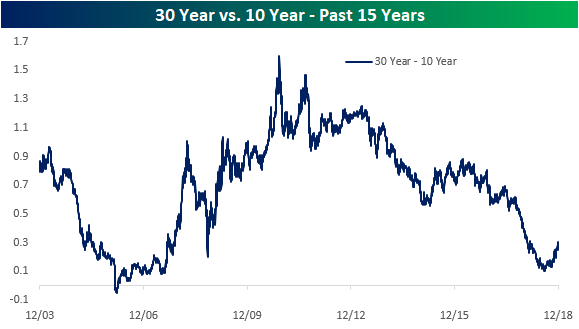 Call us old school, but we still think earnings drive long-term stock gains, and this is a great sign amid all the market volatility,” explained Senior Market Strategist Ryan Detrick. Small Business optimism in the US was weaker than expected in October (107.4 vs 108). After hitting a record high two months ago, the headline index has now declined for two straight months. We would note, however, that outside of 2018, there have only been four monthly prints going all the way back to 1975 where the headline index was higher. According to NFIB, current levels continue to support economic growth in excess of 3%, which is great for businesses and consumers, but not the best news for stock market bulls hoping for a more dovish FOMC. Two of the key stats of the report: 30% of business owners believe now is a good time to expand substantially and 38% of small business owners reported job openings that they couldn’t fill. The job market is definitely tight. The tight labor market is also reflected in the fact that nearly a quarter of all small business owners report that Labor Quality is their number one problem and another 9% cite labor costs as their biggest problem. On a combined basis, labor issues were cited by just under a third of all small business owners, which is slightly more than the combined impact of Taxes and Red Tape. On a closing basis, the S&P 500 nearly reached correction territory in late October when it declined 9.88% from its high close on September 20 to its recent low close on October 29. After bouncing higher ahead of and after Election Day, S&P 500 has fallen for four straight days and is on track for a fifth day of losses today. But, just how good of an indicator is the S&P 500? Is it really on track to forecast a U.S. or global recession in the near future? A look back at S&P 500 past track suggests about a 1 in 3 chance of recession at this point. First a quick review of definitions. A bear market is defined as a 20% or greater decline in the S&P 500. A correction would be a decline greater than 10% and less than 20%. Based upon these definitions every bear market begins as a correction, but not every correction becomes a bear market. As of today, the S&P 500 is not yet even in a correction. To be in a correction it would need to close below 2637.67. Since June 15, 1948 there have been 11 S&P 500 bear markets and 24 corrections. Excluding the current pullback from the tally there have been 35 declines in excess of 10%. However, the National Bureau of Economic Research has only identified 11 recessions over the same time period. This works out to less than 1 recession for every 3 S&P 500 declines in excess of 10%. Current market weakness could manifest into a full blown bear market, but economic data, corporate earnings and consumer sentiment would need to deteriorate significantly. Currently forecasts are looking for a slowing in growth as the initial effects of tax cuts and deficit spending wane, but corporate profits are not expected to decline, only slow their pace of growth. A slower pace of gains from the market would likely result. With the S&P 500 falling 9.08% QTD, it has been the sixth-worst start to the fourth quarter in the history of the S&P 500. The only worse Q4s (through 37 trading days) came during some of the worst years for the stock market (1929, the 1930s, 1973, 1987, and 2008). Below is a table showing the worst starts to Q4 for the S&P 500 through 37 trading days. Any drop of more than 2% at this point in the quarter made the list. As shown in the table, the average change for the S&P for the remainder of these years has been a gain of 2.77% with positive returns 78.26% of the time. For all other Q4s in the S&P’s history, the average change for the remainder of the year has been +1.61%. Of course, it’s not all good news. If you look at the window of Q4s that were down between 8% and 12% like we are this year, the S&P actually declined for the remainder of those four years. And in case you don’t remember, at this point in Q4 2008, the S&P was down 35.5%! In that year, the S&P ended up rallying 20% for the remainder of the year before plummeting to new lows again in the first quarter of 2009. This is becoming a trend. New Home Sales for the month of October were released earlier today and once again missed expectations. While economists were expecting the headline reading to come in at 575K, the actual reading came in 31K below that consensus forecast at 544K. 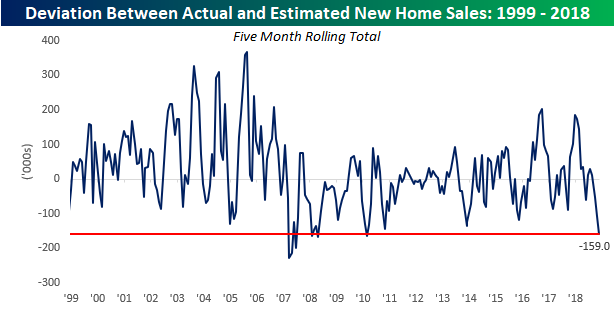 The last time we’ve seen a monthly print in New Home Sales this low was back in March 2016. Not only is this month’s report notable for the fact that sales printed at a 2.5 year low, but it also marked the fifth straight month where sales missed expectations. Usually after a couple of months of weaker than expected reports, economists adjust their forecasts to account for the weakness, but in this case, they haven’t been able to catch up. Using our Economic Indicator Database, we looked to see how the current streak of weaker than expected New Home Sales reports stacks up over time, and what we found was pretty amazing. Going all the way back to 1999, there has never been a streak where New Home Sales missed expectations for five straight months. During the housing crisis and in the early stages of the recovery, there were three streaks where New Home Sales missed expectations four months in a row but never for five straight months. Not only have economists consistently overestimated New Home Sales, but they have also been way off the mark. The chart below shows the rolling five-month spread between the actual initially reported print for New Home Sales versus consensus expectations. With misses of -31K, -72K, -1K, -18K, and -37K in the last five months, the total deviation between actual and estimated New Home Sales has been -159K. Looking back over time, there haven’t been a whole lot of periods where the spread was this wide indicating just how weak recent housing activity has been relative to expectations. On Tuesday, the front end of the yield curve inverted as 3-year yields rose above 5-year yields. Other front end curves, by that measure, while not there yet, have also begun to dip to cycle lows. 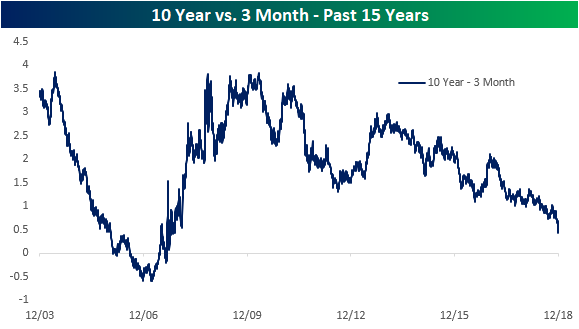 The 10-year minus 3-month spread is at its lowest level since 2007. Despite being at a low for the current cycle, the curve remains around 40 bps from inversion. 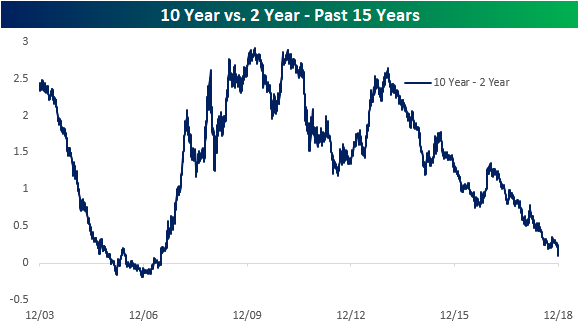 Perhaps the most widely followed curve, the 10 year versus the 2-year spread, is also at levels it has not seen since 2007. Although it is picking up slightly today as yields across the board fall, 2s10s is looking much more ominous at only 13 bps away from becoming inverted. This will be the main curve that investors will keep their eyes on; expect to see it ad nauseam in headlines if it moves those 13 bps lower. 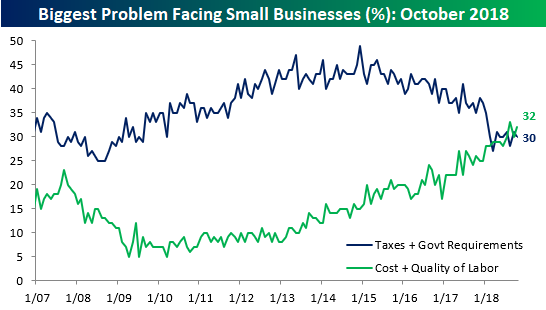 Small business optimism November showed a meaningful pullback in November on both an absolute basis and relative to expectations. While economists were forecasting the headline index to come in at a level of 107.0, the actual reading was 2.2 points lower, making it the weakest report relative to expectations since April and the largest m/m decline since March. 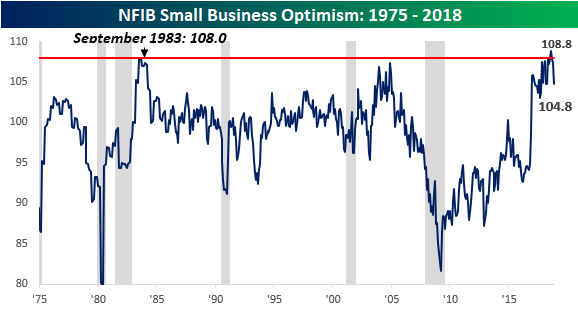 After hitting record high levels back in August, the NFIB Small Business Optimism Index has now seen three straight monthly declines, and like some other indicators around, is showing signs of starting to roll over. With that, we’ve heard and read a number of comments suggesting that this decline is another signal that the business cycle may be turning. In our section on “Economic Cycles” for this year’s Bespoke Report, which was published last Friday, we highlighted a number of economic indicators that have had pretty good records historically at anticipating a turn in the business cycle. 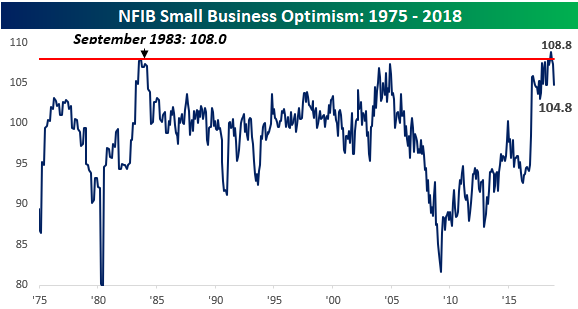 One indicator that was not included in that section is the NFIB’s Small Business Optimism Index. The chart below is the same one as above, but we have also overlaid periods of recession with gray shading. 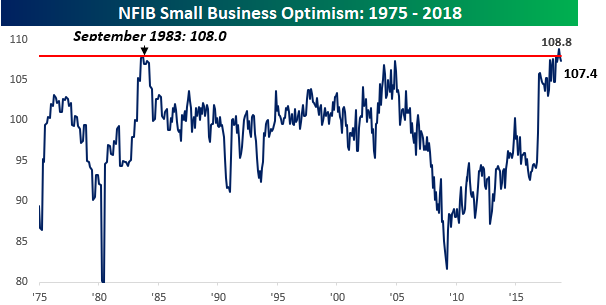 From this perspective, it is pretty obvious that there has been very little correlation to peaks in the Small Business Optimism Index and the onset of recessions. In fact, the two times the index peaked at or around similar levels was actually closer to the beginning of an expansion than the end. This is not to say that this indicator is suggesting strength or weakness in the economy going forward, but instead to simply point out that it hasn’t been the best indicator in terms of predicting the business cycle. The two charts below were published in our weekly Bespoke Report newsletter that went out to research clients on Friday. They show long-term three-year price charts of two equity indices that are generally thought of as “leading” indicators — that is, they’re thought to lead the broader indices like the S&P 500. Unfortunately for market bulls, both appear to be in serious trouble from a technical perspective. 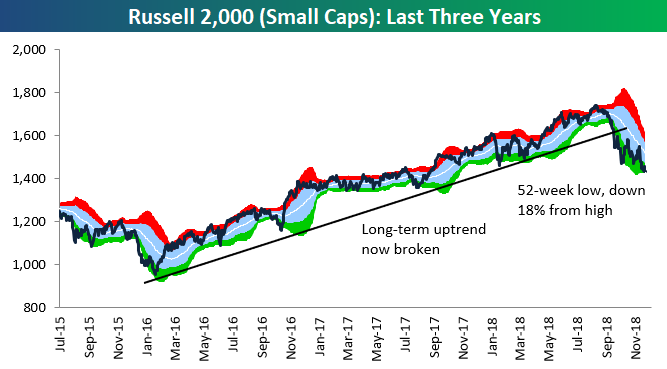 As shown, the Russell 2,000 (small-cap) and Dow Transportation indices have recently broken below long-term uptrend channels, and they have yet to find any kind of support during this correction. The Russell 2,000 is down 18% from its 52-week high, which puts it just two percentage points away from a new bear market. The Dow Transports aren’t far behind. 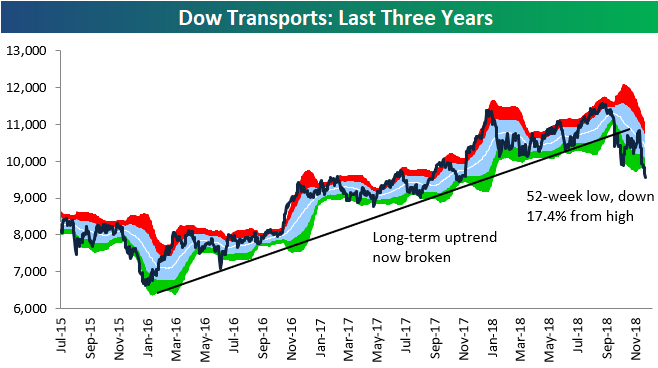 The Transports index is down 17.4% from its 52-week high, meaning a bear market isn’t far away for this area of the market either. Keep an eye on these two indices in the coming days and weeks as 2018 comes to an end. If they slip into bear market territory, it’s not a good sign for the major indices like the S&P 500 and the Dow Jones Industrial Average. 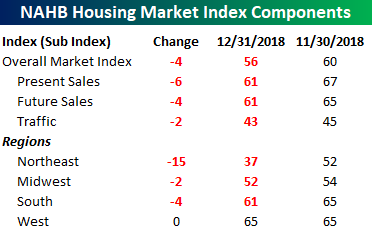 Just when you think that housing-related data can’t get any worse, the December report on homebuilder sentiment came in with a big stinker. After last month’s report where the actual level missed expectations by seven points, today’s report for December missed estimates by four points with a reading of 56 compared to expectations of 60. Combining the declines of the last two months, homebuilder sentiment has now dropped by a total of 12 points, which is the second largest two-month drop in the history of the report. Not even during the housing crisis did sentiment drop at this fast of a rate, and the only time it dropped faster was in the two months that followed the 9/11 attacks. The chart of the actual level of the NAHB Sentiment index doesn’t look pretty either. Following this month’s decline, the index is at its lowest level since May 2015. 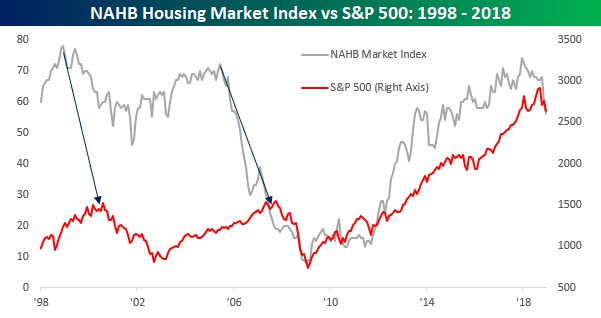 One thing to take note of with regards to the NAHB Housing Index, though, is that peaks haven’t historically been associated with the onset of recessions. At the start of each of the last three recessions, this index was well past its peak by a matter of years rather than months. The chart below shows the breakdown of this month’s report by traffic and region. We saw broad-based declines in traffic trends in December, and the bulk of the weakness came in the Northeast. Sentiment in that region dropped by 15 points, which was the largest one month decline since June 2011 and capped off the largest two-month decline on record. It was said a year ago that the Trump tax cuts would have the greatest negative impact on housing in the high tax states of the northeast, and recent data has borne this out. 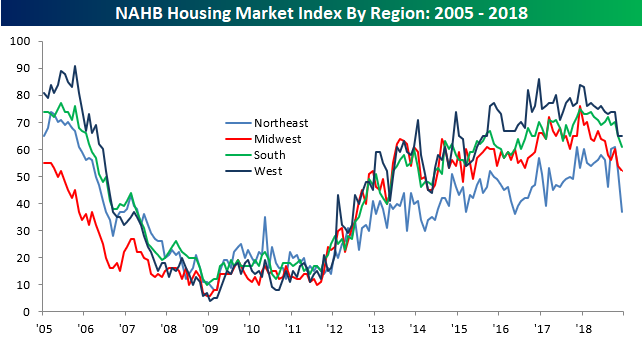 While homebuilder sentiment in the northeast has seen the sharpest declines, the trend is the same around the country- sentiment has peaked. As mentioned above, homebuilder sentiment hasn’t been strongly correlated to trends in the business cycle over time, and with respect to stock market performance, that has been the case as well. 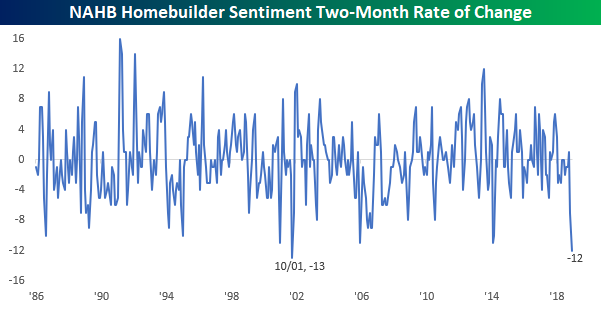 Leading up to each of the prior bear markets in the last twenty years, homebuilder sentiment peaked well over a year before the market peak. While not pictured below, we have also seen similar trends play out in prior bear markets since 1985 (when the NAHB survey data begins). Came across this infographic from a Marketwatch article this evening. The market has been showing is dissatisfaction with the Fed for the past two and a half months now. 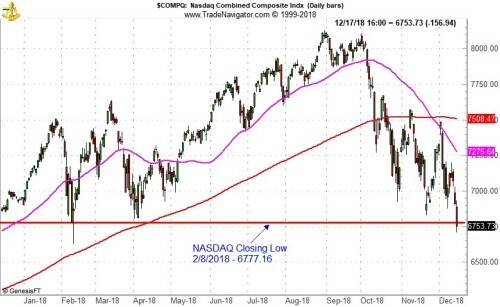 Today’s market action brought the Dow Jones Industrials, S&P 500 and NASDAQ Composite below their early 2018 closing lows intraday today: Dow 23533, S&P 2581 and NASDAQ 6777. Only the Dow was able to rally enough at the end of the day to close above its 2018 closing low. S&P and NASDAQ did make new 2018 closing lows today. Two out of three is bad, but the Dow Industrials holding above that low is slightly encouraging – and holds off the dreaded Dow Theory Sell Signal. If all three violate these 2018 lows more selling becomes more probable as there is little support below that. Next levels of support are found way back at the August 2017 lows around Dow 21700, S&P 2425 and NASDAQ 6200. 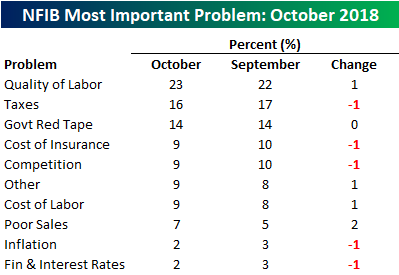 The Fed remains the single biggest risk to the market and the economy. As we said in our Market at a Glance last month: “After nearly a decade at zero, a brief pause to evaluate the impact of recent hikes does not seem unreasonable.” Stanley Druckenmiller echoed this in his commentary over the weekend in The Wall Street Journal. If the Fed goes ahead as planned with its next quarter-point increase this week, or doesn’t raise rates, but conveys or emphasizes that it is data dependent and not committed to more hikes in 2019 and that rates are close to normal and if the market can hold here then Santa Claus has a chance for a ride down Wall Street. Any hints of hawkish rhetoric will not be well received. On Wednesday another Fed meeting will come to an end and another statement regarding monetary policy will we released. As of today, CME Group’s FedWatch Tool is currently showing a 69.7% chance the Fed will raise rates to a new range of 2.25 to 2.50%. Unlike previous rate increases, there is a hint of doubt whether or not the Fed will raise this time. 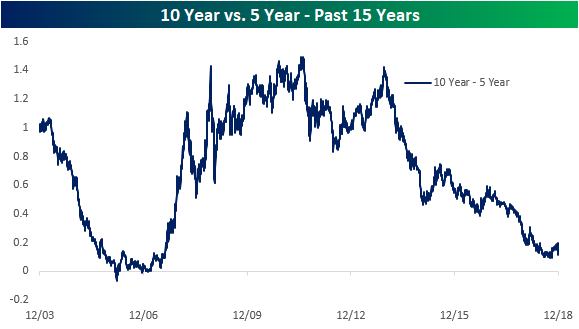 A flat/inverted yield curve has spooked traders and investors as it has historically been followed by a recession and the market has been trading accordingly. During the current Fed tightening cycle, rates have been raised in 0.25% increments 8 times with the first occurring on December 16, 2015. The second increase came nearly a year later on December 14, 2016. With the exception of the September 2017 Fed meeting, a rate hike has occurred every month in the last month of the quarter since December 2016. S&P 500 has advanced just two times out of the eight announcement days when rates were increased. Combined with the recent streak of six losing Fed days in a row, it would appear the market is growing less and less pleased with the direction the Fed is taking. 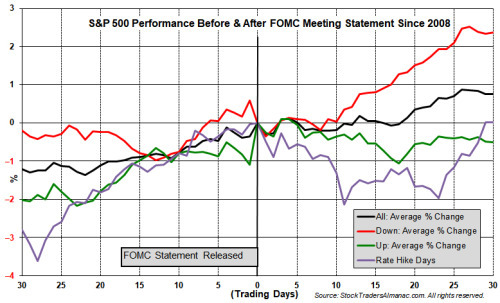 In the chart below the 30 trading days before and after the last 86 Fed meetings (back to March 2008) are graphed. There are four lines, “All,” “Up,” “Down” and “Rate Hike Days” Up means the S&P 500 finished announcement day with a gain, down it finished with a loss or unchanged. Rate Hike Days are the eight times a hike was announced. Note how past down announcement days have, on average, enjoyed the best gains over the next 30 trading days. Of the last 86 announcement days, the S&P 500 finished the day positive 48 times. Of these 48 positive days S&P 500 was down 28 times (58.3%) the next day. Of the 38 down announcement days, the following day was down 22 times (57.9%). All 86 announcement days have averaged 0.37% S&P 500 gains while the day after has been a net loser with S&P 500 declining 0.31% on average. S&P 500 has declined six times in a row on Fed announcement day. The S&P 500 may not have reached bear market territory as an index yet, but of the 500 individual stocks in the index, more than 60% are down at least 20% from their 52-week highs. Overall, the average decline from a 52-week high is a staggering 25.7%! The chart below shows the distance each of the individual components is trading from their 52-week highs grouped by 10 percentage point ranges. As of Thursday afternoon, just 72 stocks in the S&P 500 are even trading within 10% of their 52-week highs. Meanwhile, 82 stocks in the index are down 40% or more with 24 of those 82 stocks down by more than half! Have their been uglier periods for the stock market? You bet. But not in a long time. So which stocks are down the most? There are actually a number of well-known names with stocks like General Electric (GE), Western Digital (WDC), Nvidia (NVDA), Halliburton (HAL), Wynn Resorts (WYNN), Micron (MU), and Applied Materials (AMAT) all having been more than cut in half. A lot of us have been talking lately about how the last week or so of bearish market action has felt....off. Like something isn't quite right. This article from Seeking Alpha explores the same question. To be sure, this is the worst market environment seen in a very long time. 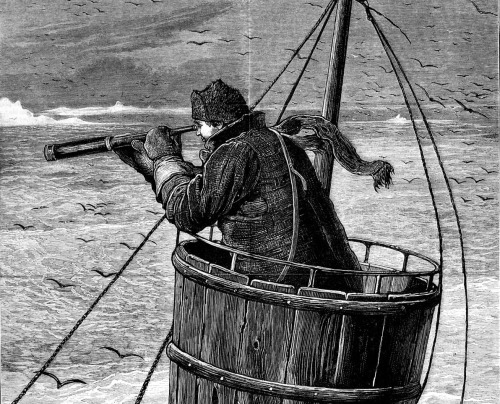 The obvious question is, why are stocks cratering? Here's my take on three potential reasons. I attended a holiday gathering for one of my advisor clients on Friday evening. While everyone appeared to be in the spirit of the season, when the conversation eventually turned to the market action, the mood quickly changed. In talking with fellow financial professionals throughout the evening, the theme of the conversations was consistent. To a man, everyone agreed that (A) this was the worst market they'd seen in a VERY long time, (B) the action "felt" like an old-school bear (relentless selling, no lift, no obvious catalysts), and perhaps more importantly, (C) there is more going on here than meets the eye. The latter is a lesson we learned from the 2007-09 financial crisis. Honestly, before then, very few investment managers (including yours truly) had ever heard of the now-famous alphabet soup of derivative securities or the "mark to market" rule that combined to nearly crush the global banking system. Today, we all know that "forced selling" (fund blowups, margin calls, and a myriad of programmatic systems) can cause markets to collapse into a vacuum as buyers simply stand aside when the algos begin to roll and/or folks "need" to sell at any price. But, on Friday evening, everyone agreed that this market definitely feels different. The point is that since 2011 - the time when many believe that high speed algo trading began to dominate the market landscape - all episodes of "forced selling" eventually ended and after a couple of days, a "face ripping" rallied tended to ensue. But this time, as the group said in unison, "there is NO LIFT at all." ALL intraday rallies are sold into - within minutes. The group further opined that this market appears to be different than even the 2011 whipsaw party, where the market moved up and down and down and up in what Tony Romo might call large chunks. 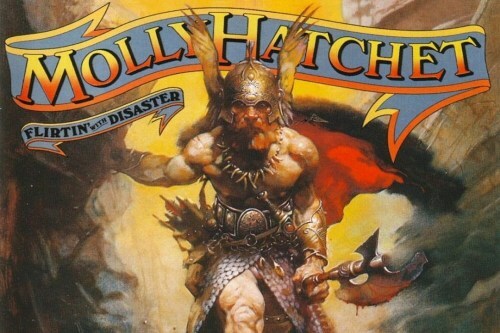 The difference was that those trends moved in a straight line and then reversed and went the other way - with reckless abandon in both directions. In my humble opinion, this was news-driven (U.S. debt downgrade, Europe crisis, etc. ), high-speed trend-following at its finest. But again, the current action feels different. Since December 3rd, the market has indeed moved in a straight line, becoming what is referred to as a "waterfall decline" in the process. But, there are no headlines to trigger the moves. No, something else appears to be at work here. And the real problem is no one is really sure what that "something" is. So, this morning, I thought I'd run through some of the possibilities kicking around in my head. There are three. One narrative being bandied about is the slowdown in earnings growth could be worse than anticipated - especially given what is happening to oil again. 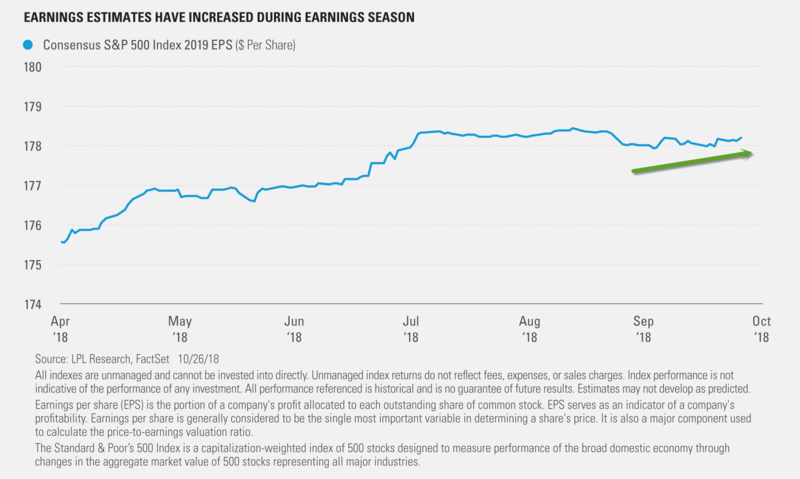 Mathematically, it is obvious that EPS growth for the S&P 500 had to fall given the 25%+ growth we saw in 2018. Everybody knows that a healthy chunk of that growth was attributable to the tax cuts and as such, won't recur. This isn't the problem. Remember, something everybody knows, isn't really worth knowing in this business (because it's already priced into the market). I think the real problem is that EPS could fall significantly more than the market has been expecting. Think about it... Higher interest rates. Tariffs. Rising wages. Economic slowdown. Any of these - and especially a combination of these - could impact corporate profits (and not in a good way). As Exhibit A in my thesis, below is a chart of Consensus Estimates for S&P GAAP EPS. Note the accelerated decline of the salmon-colored line in the upper right. This shows that the GAAP (generally accepted accounting principles) version of EPS estimates are falling - fast. From my seat, the real problem is that these estimates may need to fall even more - and even faster. The reasons? #Oil and #GrowthSlowing. Don't look now fans, but oil is cratering again. Not like it did in 2014/15, but the USO (United States Oil Fund ETF) has plunged -41% since October 3rd. Yowza - talk about moving in a straight line! The obvious question here is, what's up with oil? 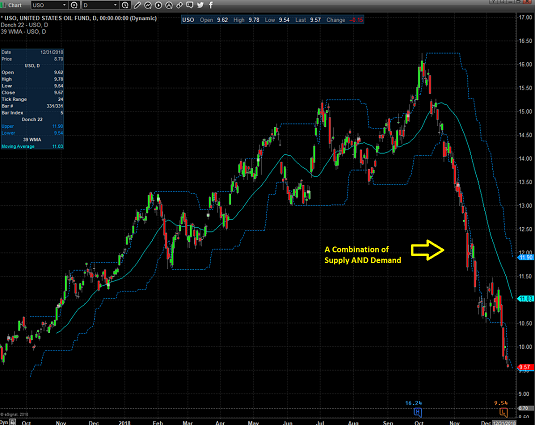 In the beginning of this move, there was a lot of talk about supply being the culprit for the precipitous decline. However, as the dive has progressed, traders have come to the conclusion that the real issue appears to be demand. As in slowing global growth means less demand for oil. Ugh. So, if oil is flat-out plunging due to the perception of slowing global demand, how long will it be before demand for other stuff starts to slow? Exactly. Premise #2: The Fed Overshoot Is On "Autopilot"
Another issue that I need to credit analyst extraordinaire Larry McDonald for is the idea that despite all the yammering from Fed officials, the markets are "really" staring at the equivalent of at least 7 rate hikes in 2019. Wait, what? Here's the deal. The Fed is in the process of "unwinding" their balance sheet. I.E. Selling off all the stuff they bought during nearly a decade of QE. In English, the Fed is selling $50 billion a month of the bonds and other securities it has on its "balance sheet." My quick math mind says that's $600 billion a year. Every year. The goal is to return the Fed's balance sheet back toward "normal." I get it. Makes sense. The problem is this has NEVER been done before. Oh, and this process amounts to a little something called "QT" (quantitative tightening). As the moniker suggests, the selling of bonds effectively represents a "tightening" of monetary conditions. Whether it was intended to or not. McDonald estimates that the selling of approximately $85 billion in bonds is the equivalent of a 0.25% hike in the Fed Funds Rate. So, if my calculator is correct, the Fed's "runoff" plan (the selling of $50 billion in bonds each month) will become the equivalent of 6.9 rate hikes in 2019. Yikes. Perhaps the biggest issue here is Jay Powell has told us that the "runoff" is on "autopilot." The impression is that the quantitative tightening, which represents significantly more tightening that the Fed has implemented over the past two years, is not up for discussion. This, dear readers, is a problem. A big problem. Because one of the baseline fears of this bear market is the Fed would overshoot - like they always have in the past - and wind up pushing the economy into recession. And while folks like me argued that the Fed wouldn't be dumb enough to go "too far," this "autopilot" QT thing could easily become the "unintended consequence" of the great post-crisis QE experiment. Now let's add in the 2 actual hikes that Powell & Co. are talking about. It quickly becomes clear that the fear of a "Fed Overshoot" is well, real. And I'll bet dollars to donuts that this a point very few investors or financial pros are aware of. But apparently the algos are. Now couple the Fed's balance sheet reduction plan with the massive increase in low quality debt issued in recent years, the $1 trillion in government bonds the U.S. needs to sell in 2019, the instability of banks Europe (have you seen a chart of DB lately?) and the fact that QE is ending everywhere (except Japan, of course). And while I consider myself a card-carrying member of the-market's-glass-is-half-full club, even I must admit to the possibility that another credit crisis could be lurking. So... Cue the 500-point temper tantrums in the stock market and the dive in bond yields over the Fed's current course. The good news is that in a CNBC interview Friday morning, New York Fed President, John Williams suggested that the Fed's current plan to sell $50 billion in bonds each month is not set in stone and that the Fed can be flexible if need be. The headline sparked a rally and the Dow surged more than 300 points in the next 9 minutes. This was certainly encouraging. Well, for about 10 minutes anyway, as the selling then resumed in earnest and continued throughout the day and into the close. Since the Dow finished down 414 on the day (representing a reversal of more than 800 points), one can argue that markets want more than "hints" or "jawboning" on this subject. Especially since the "autopilot" verbiage had been used by the Fed Chair just two days prior. And finally, there is the underappreciated worry behind door number 3. This one comes from the Wall Street Journal's Greg Ip. During a CNBC segment Friday afternoon, Ip pondered aloud the following: What if 2018's 3% growth in the U.S. economy was a "head fake?" Ip pointed out that up until 2018, the U.S. economy had been muddling along at what First Trust's Brian Wesbury dubbed a "plow horse" pace. And if one mixes in the slowdown in global growth (remember, Germany, Japan, and Switzerland already have one quarter of negative GDP growth under their belt), the trade war, the potential for political risk in D.C., etc., it isn't much of a stretch to think that the U.S. economic growth, like earnings, could slow more than the markets have been anticipating. Super. From my seat, these three underappreciated fears help "esplain" the waterfall decline in the stock market and are reasons that the bears could stick around for a while (I'm thinking 3-6 months). But let's keep in mind that the current dance to the downside has clearly gotten out of hand. For example, the S&P 500 fell -7% last week alone, qualifying as the worst week since 2008. This is now the worst December since 1931. The NASDAQ is now -21.9% off its high and into what the press calls a bear market. The key is the December destruction has created a seriously oversold condition on all major time-frames, put negative sentiment at extreme levels, and created what could be construed as a "washout" on Friday with the VIX climbing over the all-important 30-level. As the table points out, the market has rallied +4.84% on average over the next week and +7.46% over the next two weeks after cases of smaller investors panicking to buy put options. There is similar research from Bespoke Investment Group. The chart below shows what happens to the S&P 500 after quarters in which the index has fallen 10% or more. And to finish off the topic, here are some stats to consider from Ned Davis Research. Since 2000, when S&P is down -13% or more over 63 trading days (there have been 5 prior occurrences), the market has moved higher 4 out of 5 times over the next 5 and 10 days. The average gain for the S&P has been +3.48% over next 5 days and +1.6% over the next 10 days. Over ensuing 21 and 63 days, the index has moved up 3 out of 5 times with an average gain of +1.4% over the next 21 days and +2.5% over the next 63 days. As such, it is easy to say the bulls are due. Really due. bigbear0083 and Onepoint272 like this. Onepoint272 and bigbear0083 like this.